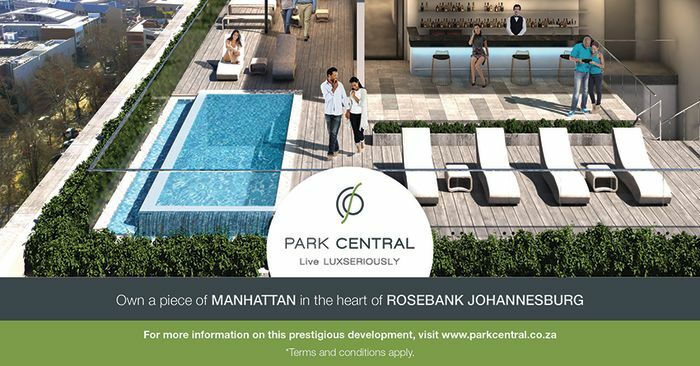 Get a taste of the Park Central lifestyle and see what it feels like to live like a serious achiever. Send a voice note to 078 985 6758 and tell us why you deserve to experience an unforgettable night consisting of dinner for you and nine friends in one of the luxurious Park Central penthouses in Rosebank up to the value of fifty thousand rand. All this week, 702’s Bongani Bingwa will award one daily finalist with R2000 and the chance to win the ultimate dinner in the sky. Park Central apartments in Rosebank were created in response to a shift in the way people want to work and play. This international trend calls for a re-imagining of residential space, introducing a sophisticated suburban lifestyle into a chic urban setting. With a nod to its Manhattan namesake, this 20-storey residential development delivers iconic features, from magnificent penthouses to signature ‘sky’ gardens. And you could win a decadent ‘Dinner in the Sky’* at one of Park Central’s stylish penthouses. Simply send us a voice telling us why you think you should live the Park Central lifestyle for one night. This promotional Competition (“Competition”) is run by Primedia Broadcasting Proprietary Limited (Registration Number: 1994/003707/07), (“Primedia”) through its 702 radio station on behalf of Redefine Properties Limited (Registration Number: 1999/018591/06), (“Redefine”), (the “Promoter”). This competition runs on 702 with WhatsApp entries from Saturday, 13th April with on-air winning moments from Monday, 15th April to Friday, 19th April 2019 on The Breakfast Show with Bongani Bingwa (the “Presenter”). To participate in this Competition listeners of 702 must send a WhatsApp voice note on telling us why they can see themselves in a spectacular location like Park Central.702 will select, at its sole opinion, the best two voice notes received from the entries submitted, which two voice notes will be played out on air and 702 will choose and announced a winner, at the sole discretion and direction of the Presenter, daily from the entries received from (13th April – 19th April). The daily winner is awarded with R2 000 prize money as well as an exclusive viewing of Park Central. One winner, from the daily winning entries will be chosen by an independent auditor and announced on the Friday during the Breakfast show and will be awarded with the main prize – a Penthouse Soiree for 10 people to the value of R 50 000.00. The Presenter and/or the judges’ decision is final, and no further correspondence will be entered into. The prize is not negotiable, not transferrable, and cannot be exchanged. Primedia, 702 and Redefine will not be liable for entries not received for any reason whatsoever, and will not be responsible for any cost for submitting any entry or any network connectivity or hardware issues experienced while participating. A participant will not be eligible to win this Competition if they have won a prize on any of Primedia’s radio stations namely Cape Talk, Kfm, 702 or 947 within the past 90 days, whether on-air, online or via any of the station’s social platforms. If a winner chosen does not comply with these terms and conditions, their entry will be disqualified, and a new winner will be randomly selected. In the event that a winner cannot be successfully contacted, or is ineligible to accept the prize, or contravenes the terms and conditions of this Competition or those of 702, the prize will be forfeited. Primedia will notify the winner telephonically when the prize is ready for delivery or collection, based on the receipt of requested documentation. Redefine and/or Primedia reserve the right to cancel or amend the Competition and these terms and conditions without notice. Any changes to the Competition will be notified to participants as soon as possible by the promoter. No participant will have any claim against Redefine and/or as a result. any person, directly or indirectly, who controls or is controlled by Redefine and/or Primedia and/or immediate family members of any employee, director, member, partner, agent or consultant of or person, indirectly or directly, in control of or controlled by Redefine and/or Primedia. Entering this Competition, a participant is indicating his/her agreement to be bound by these terms and conditions. Redefine may invite the winner to appear in the electronic media and/or the print media, and/or to endorse, promote or advertise Park Central, for which no fee, royalty or other compensation will be payable. The winner may decline such an invitation. Redefine will not share any participant’s or Winner's information with any third parties without that party's express permission. Participants in the Competition are obliged to comply with all applicable laws. If any part of these terms and conditions or the Competition or the participant's participation in the Competition are subject to the Consumer Protection Act, No 68 of 2008 ("CPA") or the Protection of Personal Information Act, No. 4 of 2013 ("POPI"), it is not intended that any part of these terms and conditions contravenes any provision of the CPA or POPI. Therefore, all provisions of these terms and conditions must be treated as being qualified, to the extent necessary, to ensure that the provisions of the CPA and POPI are complied with. To the maximum extent permissible in law, Redefine and/or Primedia shall neither be responsible nor liable for any accident, injury, harm, death, loss or damages of whatsoever nature, howsoever arising, as a result of a participant’s participation in the Competition, unless Redefine and/or Primedia has acted fraudulently or with gross negligence. These terms and conditions and the relationship between the participant and Redefine and/or Primedia shall be governed by the laws of the Republic of South Africa. All queries can be sent to comment@702.co.za. Nothing beats those window seat views. Or the aisle seat & your freedom to move. Get a taste of the Park Central lifestyle! Win 1 of 10 summer hampers with KAMERS on 702. Time Square, Sun Arena on 4 November. Recognising that it takes more than just grit and passion to run a great small business. Congratulations to our 702 competition winners.